Irish Dressage rider Judy Reynolds and the Joe and Kathleen Reynolds-owned gelding Vancouver K, have set a new Irish record score of 80.290% on their way to a seventh place finish against a world class field in today’s (Saturday) FEI World Cup Freestyle To Music Grand Prix in Amsterdam (NED). Speaking afterward’s, Reynolds was thrilled to set a new record and has now set her sights on the 2019 European Championships which take place at Rotterdam (NED) in August. Reigning FEI World Cup champion and six-time Olympic Gold medalist, Germany’s Isabell Werth, took the winners prize with Weihegold OLD on a score 86.810%. 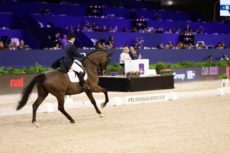 Judy Reynolds and Vancouver K finished fifth in the FEI World Cup Grand Prix in Amsterdam on Friday, coming on the back of two more fifth place finishes at the Mechelen World Cup show in Belgium last month. The result in Amsterdam moves Judy Reynolds up to 21st place on the Western European World Cup league table with two qualifying rounds remaining.